Sukshanthi – Celebrate the Healthy you! Sea Bees Diving & Mangosteen Resort – Adventure in good hands! Our Dive Partner “Sea Bees” co-operates with the Mangosteen Resort since the opening day (March 2003). Expert Sea Bees dive instructors also provide the weekly introduction diving courses in our pool, twice a week. Phuket’s waters are one of the Top 10 destinations in the World for diving and the resort is just a short drive away from Chalong Pier, where the dive excursions start. An idea base for all Phuket divers! 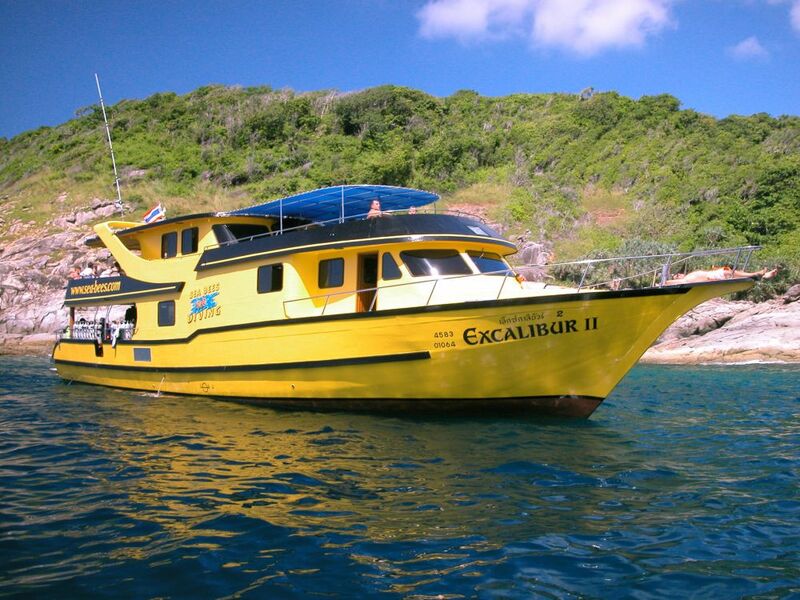 Excalibur II brings our guests to all the well-known and beautiful dive spots around Phuket on a daily basis. With its level of service and comfort, it is one of the most modern daytrip boats in Thailand with an emphasis on safety. Because of its design and construction, this boat is extremely stable in the water. We dive in small groups of 4 people with 1 guide. Because of the relatively long distance to some dive spots, we offer daytrips with 2 or more dives. With a length of 23m and a width of 6m, our daytrip boat offers various degrees of pleasure. This boat has a specially designed large dive deck with sufficient space to gear up and store your equipment. The broad diving platform guarantees safe jumps into the inviting waters. Large stepladders aid easy equipment removal and return to the boat and are also suitable for beginners. After each dive, fresh water is available for washing dive gear and shade is available to hang equipment for drying. There are also separate fresh water tanks for dive computers and underwater cameras. When diving more than 1 day with us, you can also store your dive gear in the onboard store room. Furthermore, the boat has 4 showers. Unlike other dive boats, ‘Excalibur II’ has 2 toilets especially adapted to western and environmental standards. On the upper deck, you will find 2 spacious saloons with a bar and a separate non-smoking area. Our barkeeper is keen to spoil you with delicious milkshakes, fresh fruit cocktails and other drinks. Alcoholic drinks and different types of beer are available – but only after the last day’s dive! Our onboard cook produces mouthwatering western and Thai dishes for breakfast and lunch. During our Super Sunday trips, dinner is also included. There are also two large sundeck areas, partially shaded, to relax and sunbathe on during the surface interval. Our bar and sundecks convince many a non-divers to spend a relaxing day on the boat, which makes it a great family day out. 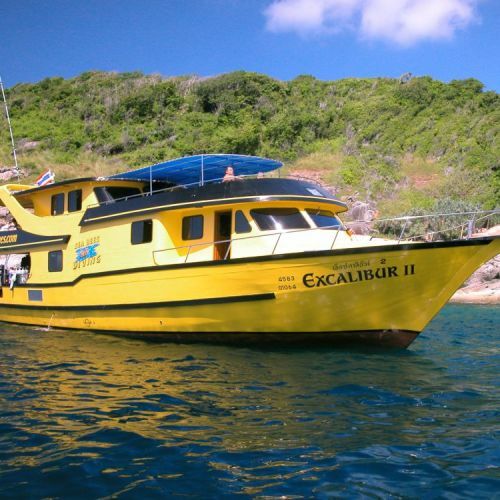 Overall, ‘Excalibur II’ is a well thought out and specially designed diving boat – even for the more discerning client. Sea Bees Diving’s fleet of 8 boats means we are able to guarantee to keep our high level of service during your diving holiday. This is certainly one of the reasons we have been awarded the “Golden Dolphin“ for Best Diving Centre in South East Asia & Pacific 8 times. Please reserve your dive trips at our reception! By being an 8 times winner of this sought after trophy as the “Best Dive Center in South East Asia,” and with several second places, we have been able over many years to enjoy the trust of the divers and voters of this award. No other dive centre in Thailand has previously been honoured with this prize. Most other dive boats serve mainly as a means of transport for “boatless” dive operators and function more as a dive taxi and not as a comfortable and well-organised dive boat belonging to one single dive centre. Sea Bees does not do do factory production line diving. As the majority of Sea Bees guests are our own customers, you will always find yourself on the boat you chose – a Sea Bees owned boat. Here, you will be welcomed and treated as a special guest instead of a number being shipped to your dive site – this we guarantee! As the first and only dive centre in Phuket and Khao Lak, Sea Bees Diving was honoured with this prestigious award from the Ministry for Tourism & Sports. The criteria covered service, safety as well as an emphasis on the environmental impact of the operation. An award of which we are extremely proud. Sea Bees Diving is the only dive centre on Phuket which has its own dive resort and the harbour within walking distance. This will save you a transfer by minibus and sometimes a longer drive due to traffic jams, especially during rush hour. This means getting up later in the morning and leaving the dive centre on your return on your own terms – unless you want to hang around for a “post-dive” drink! This covers safety in the dive centre, the compressor as well as on the dive boat. An independent committee thoroughly examines these criteria and assigns stars based on their own strict guidelines. Sea Bees Diving has been awarded the maximum amount of 5 stars and possesses, as the only dive centre on Phuket and in Khao Lak, internationally certified safety. Contrary to other dive companies, we operate exclusively with our own boats and do not book guests on other dive vessels. Our boats are our signature and form a local guideline which others try to match. This gives you the benefit of ending up on the boat you actually booked and not “one day here, the next day there” on different vessels. Just keep in mind that the cruise to the dive sites around Phuket and Khao Lak averages a minimum of 1.5 – 2 hrs. You spend a lot of precious holiday time on the boat and should not have to make any compromises – even when it comes to safety. Quality Divers is an international association of elite dive centres who only include the best from each country. Sea Bees Diving is extremely proud to be the exclusive representative for Thailand. Apart from the assurance of booking with a reputable dive centre, you also have the advantages of Quality Diver Member Card which entitles you to discounts in the future on diving at the best dive centres worldwide. This ratio is not up for discussion and we therefore dive only in very small guided groups. Our guides are specially trained for this and can show you underwater “creatures” which you might never have found on your own. Although this should go without saying, sadly it isn’t. Our guides will always try to extend your dive time to 60 minutes to ensure maximum dive pleasure. As the subsequent surface and desaturation interval is a very important factor for your health and safety, it will be always a minimum of 1.5 hours. Longer dive time + sufficient desaturation = better performance and added safety. The Mangosteen Restaurant offers cooking classes in-house, right in the middle of the restaurant. Our chefs will assist you to prepare a choice of 3 different set menus. All dishes are well known classic Thai recipes and ingredients are easy to find in your home country. There is a lot to discover in Phuket but also directly in the resort. If you are interested in joining a Batik Class or maybe learn how to fold a monkey out of a towel, simply contact our reception team. Or how about some Thai fruit carving? Phuket’s beautiful surrounding Islands are best to be discovered on one of the boat daytrips provided by the resort partners. There are various island hopping and snorkeling trips available, as well as our dive partner “Sea Bees”, one of Phuket’s best dive operators. Remember “The Man with the Golden Gun? The classic James Bond was a huge success and made Phangna Bay famous in 1974. Today, take a sea canoe and paddle through the cases and lagoons. An unforgettable experience, we believe an absolute “must do” in Phuket. Inspired by the colorful heritage of Thailand, “Fantasy of a Kingdom” is an audio-visual extravaganza that for the first time anywhere, incorporates Thai culture with magical illusions, aerial ballet, elephant performances and 4-dimensional in-theater effects. Siam Niramit is a world-class performance of Thailand’s arts and cultural heritage. This must-see spectacular show features over 100 performers, lavish costumes and stunning set designs. The North, the North-East, the Central Plains and the South Seas are presented by their different music, costumes and culture.